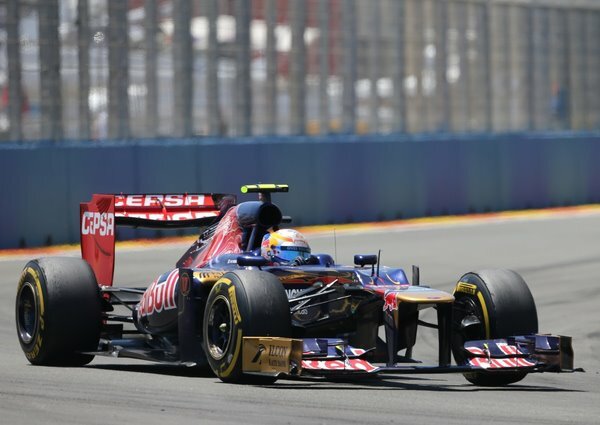 Scuderia Toro Rosso has made its decision to retain the current squad of Daniel Ricciardo and Jean-Eric Vergne for 2013. It’s not a surprise after all as the poor string of performances came along since the beginning. At least they will have understood that despite having skilful drivers the car should be competitive enough to fight in the midfield. The sister team of Red Bull has arguably had their best campaign in 2011 scoring twice as much points as in the prior two seasons. Both its drivers, Alguersuari and Buemi, drove their heart out in every single race like there was no tomorrow. There was little to choose between them until the very end amidst each having encountered a flurry of bad lucks. It was clear that only one of them would be retained to pair up Ricciardo the following season, but Dr. Evil, Helmut Marko, who largely influenced in Vettel’s career and played a part to bring Montoya into F1, has had other plans. He ousted both the drivers to make way for the now existing line-up. He argued that Toro Rosso was a school to nurture young talents and time ran out on them. So bitter it was, Alguersuari once admitted that Lotus team enquired about him but since he’d a word agreement to stay put with STR he let that chance went by. For 2012 then, Buemi took the reserve role with Red Bull while Jaime acted as a Pirelli test driver. Before the season started, Ricciardo already debuted in 2011 for HRT back in Britain and continued till the season’s end with the Spanish outfit and Vergne was high on confidence after winning F3 title. Ricciardo impressed in his home race as he brought home a couple of points followed by Vergne’s eighth place finish in the wet Malaysian race. Since then, disaster struck as they battled hard to make it into Q2 with JEV being the usual casualty to be left out with the bottom six. It took them until Spa for a double points finish and repeated that feat later in Korea. It’s evident that the Faenza-based team has found some pace since the Asian flyaway races but it’s too little too late to take the fight back to the competitive mid-pack teams. “I am really pumped to know that I am continuing with Scuderia Toro Rosso for another season and want to thank the team and Red Bull,” he said. “There are big expectations for next year and I’m ready and willing to fulfil them. “I am really happy about this great news,” said the 22 year-old. “Thank you Toro Rosso and thank you Red Bull, who have backed me since the early days of my career. It has been a difficult season and, as a rookie, I have learned a lot, thanks to the support I got and the excellent relationship I have enjoyed with all the guys. Equally delighted team principal Franz Tost quipped: “Both drivers have done a good job this season. Daniel joined us with a few Grands Prix under his belt and so his feedback and experience was particularly useful while Jean-Eric got up to speed, often having to deal with tracks he had never seen before. I am glad to see that Torro Rosso is giving the drivers another year to get a feel for the seat. While not all drivers can be like Sebastian Vettel by going out and scoring points in first few races, he has proven that this team can win!